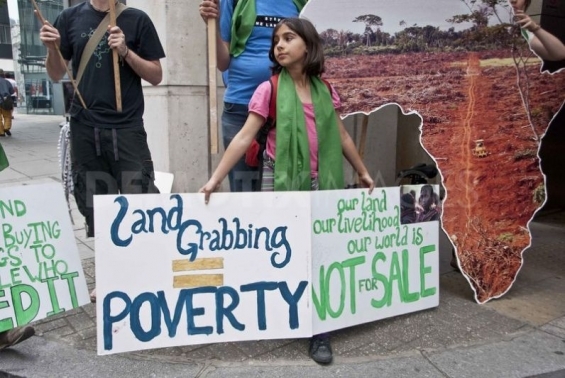 Every day, some of the world’s poorest people are turned off their land losing their homes, jobs and livelihoods. But behind the scandal of this “daylight robbery” are the demands of Western nations for food, fuel and other commodities. This global “rush” for land has gone largely unnoticed by those whose nations are largely responsible. An estimated 200 million hectares (23 times the size of Ireland) has been taken away from individuals and communities in the developing world over recent years. With little legal protection, people who traditionally supported themselves and their families by growing crops or raising livestock, are now left without a home or the ability to provide for themselves. Corrupt governments frequently collude with the corporations to hand over land and even using militias to evict people by force. Rachel Ibreck is a lecturer in Peace and Conflict in the University of Limerick who is researching how communities in developing countries can fight against land-grabbing. She spoke with VOX magazine about her research and about the implications for us in Ireland. Some non-profit groups were working to mobilise the communities to fight the corporations by providing them with information and support. But without help from outside, few groups can match the power and influence of the corporations.